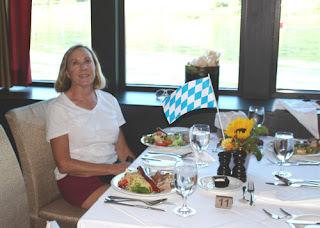 I had never been on a river cruise but had heard many good things about this mode of travel. 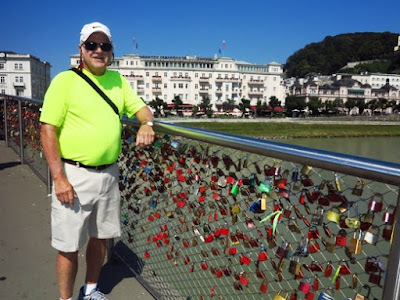 So last summer Larry and I booked the Romantic Danube cruise on AmaWaterways, a fascinating journey from Vilshofen, Germany to Budapest, Hungary. We added the pre-cruise option from Ama to spend three days in Prague, Czech Republic before boarding the ship. Afterwards, we chose to spend three more days in Budapest on our own before heading home. There’s much to like about sailing on the storied Danube. Sure, the distance the ship traveled in seven days could have been driven in five hours. But this slower method of travel allowed us time to explore towns small and large along the way. When choosing a river cruise, it’s important to consider the company and the ship. 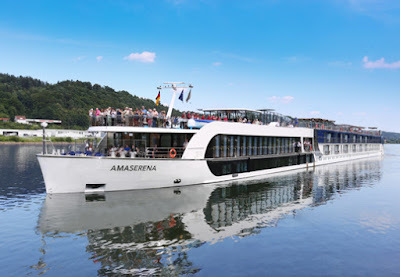 AmaWaterways is one of the premier river cruise companies with a reputation for excellent service. Sure enough, the staff was accommodating and eager to make sure we had a good time and our needs were taken care of. AmaSerena, the ship we chose for this trip, launched shortly before our August 2015 cruise, so we knew it would have the most advanced features. One that appealed to us was the Twin Balconies concept, an indoor French balcony with floor to ceiling windows (we never tried to see if it opened), and a private outdoor balcony with two chairs and a small table. Even though we like an outdoor balcony we found that it wasn’t as useful (on this particular cruise, at least) as we had anticipated. Since ships on popular cruises like the Danube often dock at ports two or three deep—and very close together-- sitting on the balcony wasn’t an option (unless you wanted to welcome someone from the other ship to your room!). Also, since most traveling was done at night, we didn’t use the balcony because it was dark (and we were sleeping!). Besides, the observation deck is easy to get to, so most passengers found that a better place to gather and watch the passing countryside. AmaSerena carries a maximum of 164 passengers, so it’s easy to mingle and make friends. Everything on the ship is just steps away—and I’m not sure anyone used the elevator. Our cabin was a generous 235 square feet with ample storage for our clothes and necessities. A granite desk and spacious bathroom—with a window so we could see outside while brushing our teeth—were pleasant surprises. Public lounge areas, dining rooms, and outdoor spaces were beautiful and comfortable. Afternoon tea featured an array of sandwiches and sweets; tea, coffee, water, and a healthy drink-of-the- day were always available. The main dining room offered buffet style breakfast and lunch, although ordering from the menu was always an option. Beer and wine were included with meals. 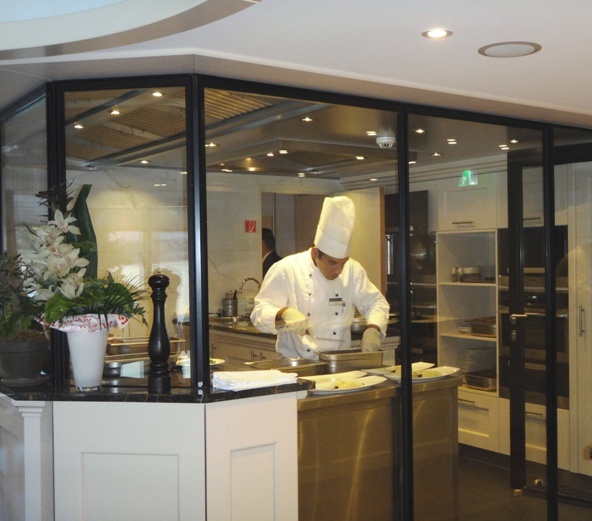 As a special treat, guests could sign up to dine at the Chef’s Table (no extra charge), an intimate restaurant at the end of the ship with a private chef preparing dishes in view of the diners—and gorgeous views of passing scenery through large picture windows. Chefs prepare dishes in full view of guests. Biking along the Danube near Durnstein. One of the first river cruise lines to put bicycles on board for guests to use, AmaWaterways carries a fleet of more than two dozen bikes and plenty of safety helmets. We made use of these in Melk, riding on a path along the Danube for 12 miles. On some cruises passengers may be allowed to venture on their own; however, we were required to remain on the group tour as we pedaled along the riverside bikeway. We participated in the included small group excursions led by local guides at each port to learn about the culture and heritage of each region. We still had time for independent exploration, shopping, and activities like attending an organ concert on our own in Passau. Special “slow walker” and “late riser” excursions were offered as were additional options that we found to be fun and educational--worth the extra fee. 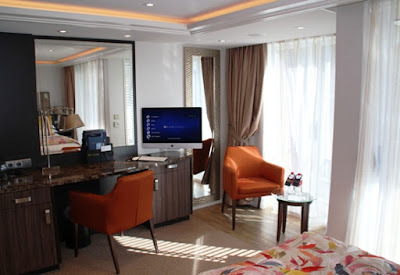 Like most travelers, we're used to being “connected,” so we were delighted with how well the ship’s complimentary Wi-Fi and high-speed, in-room Internet worked. No more time-consuming log-on processes or scrambling to find hot spots when on shore. Dining was always a highlight of the day. We were too busy to try out the beauty salon or in-room entertainment like movies on demand or travel videos. Same for the massage and fitness center--we got our exercise walking miles each day! As for the itinerary and what we did on our Danube River cruise, I’ll cover these in several follow up articles. Note: This trip was funded entirely by the writer, and opinions are her own. Thanks for the great review of your river cruise on the Danube. We can compare notes when we return in December.